Randall Munroe describes xkcd as a webcomic of romance, sarcasm, math, and language. While it's practically required reading in the geek community, xkcd fans are as varied as the comic's subject matter. This book creates laughs from science jokes on one page to relationship humor on another. 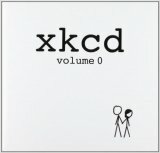 xkcd: volume 0 is the first book from the immensely popular webcomic with a passionate readership (just Google xkcd meetup). The artist selected personal and fan favorites from his first 600 comics. It was lovingly assembled from high-resolution original scans of the comics (the mouseover text is discreetly included), and features a lot of doodles, notes, and puzzles in the margins. The book is published by Breadpig, which donates all of the publisher profits from this book to Room to Read for promoting literacy in the developing world.